WHAT IS THE UNIVERSITY OF ILLINOIS MASTER NATURALIST PROGRAM? The mission of our program is to provide science-based educational opportunities that connect people with nature and help them become engaged environmental stewards. Our vision is to give individuals the opportunity to experience nature, develop knowledge of and respect for the environment, and practice natural resource stewardship. WHAT TYPE OF VOLUNTEER SERVICES DO MASTER NATURALISTS PROVIDE? Volunteer service projects may include "wildscape" maintenance; stream bank, wetland, forest, and prairie restoration; fish, wildlife, and plant inventories; environmental education programs for youth and adults; interpretive tours at a nature or visitor center. HOW DO I BECOME A MASTER NATURALIST? 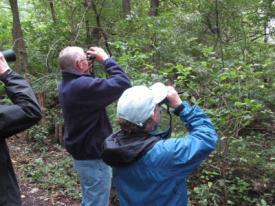 Master Naturalists are adults 18 and older who love the natural environment. They must be members of the local community who are interested in habitats, ecosystems, natural resources and the environment and who are willing to devote time to volunteering and ongoing training. Certified Master Naturalists are only those who have completed their classroom training and internship. Certification is limited to one year from the time of granting, but is renewable by remaining active as a Master Naturalist volunteer. To be considered an active Master Naturalist, one's volunteer service and continuing education requirements must remain current each year. Applicants are recruited and informally interviewed. Once accepted, trainees are required to attend all training classes, which are scheduled one day a week from 9:30 AM - 4:00 PM in the fall. Participants receive a minimum of 40 hours of both classroom and hands on field training, so participants experience and practice what they learn immediately. The curriculum covers topics such as: ecological concepts; weather and climate; ecosystems, such as forests, prairies, and wetlands; agriculture; soils and geology; landscape interpretation; human history and prehistory; and other traditional naturalist disciplines (e.g. ornithology, mammology, and herpetology). Each topic will likely be taught by a different specialist, with instructors recruited from local universities and colleges, community colleges, state scientific surveys, fish and game agencies, conservation agencies, botanical gardens, zoos, nature preserves, forest preserves, native plant societies, national wildlife refuges, and so forth. See what's new with Illinois Grand Prairie Master Naturalsits on our Facebook Page.